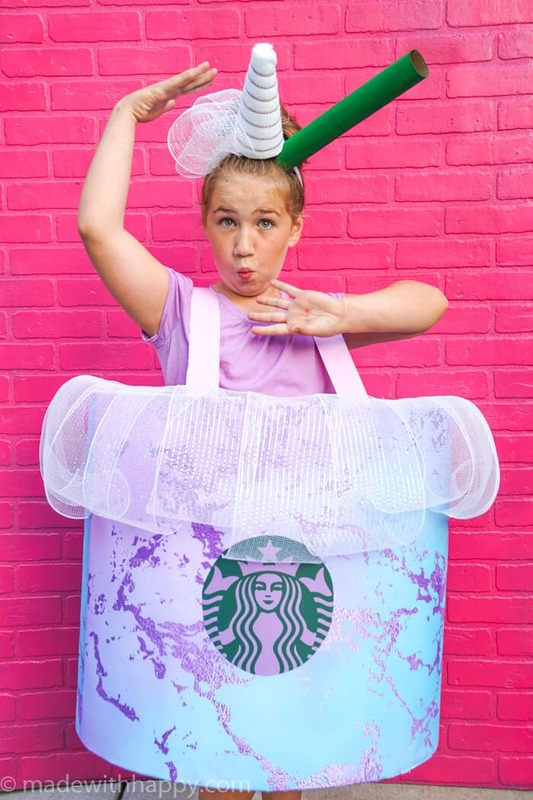 This Starbucks Unicorn Drink DIY Costume, is easy, inexpensive and all kinds of fun.We are so flipping excited to share with you our first of this year’s DIY Costumes, the Starbucks Unicorn Drink. 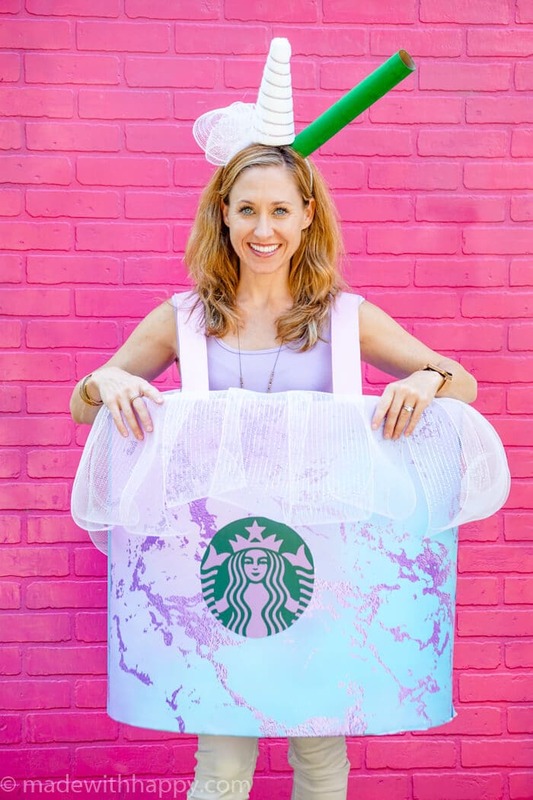 Earlier this year, Starbucks released this beauty of a drink for just a few short days and it would have appeared that everyone and their mother rushed out to get one. I mean its pink, its purple, its Aqua and topped with sweet dusting powder. 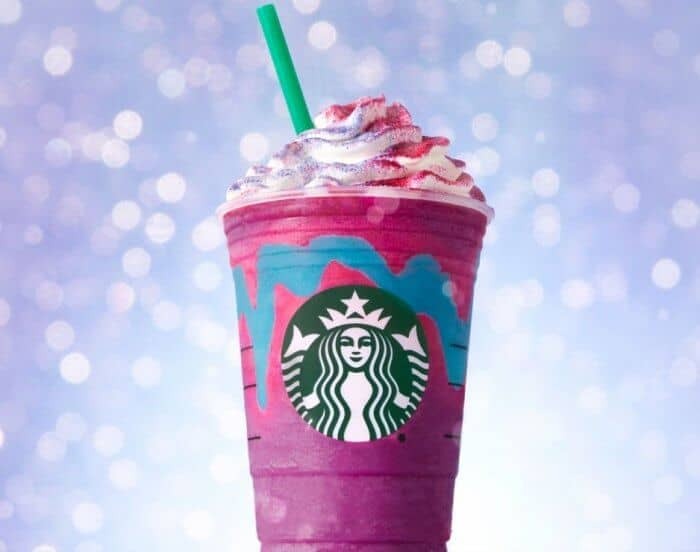 Its a UNICORN drink! 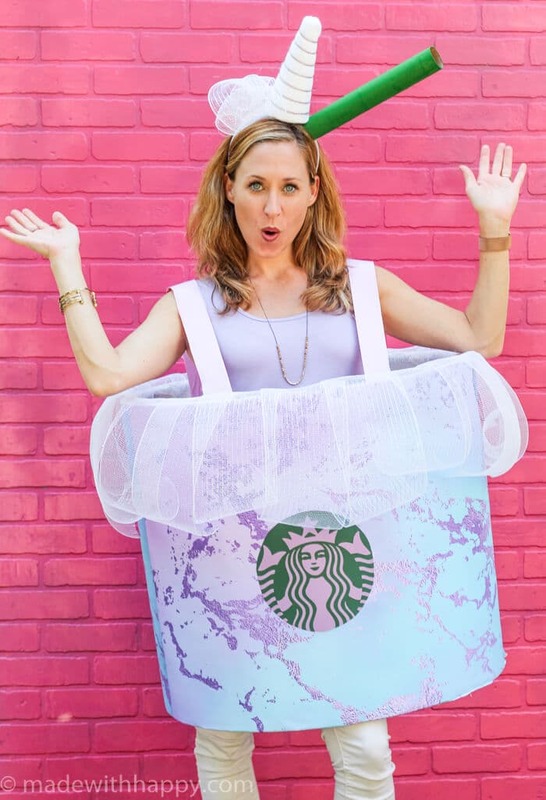 It should come as NO SURPRISE, that we are both a fan of Starbucks, and unicorns and so it made this year’s costume a complete no-brainer. 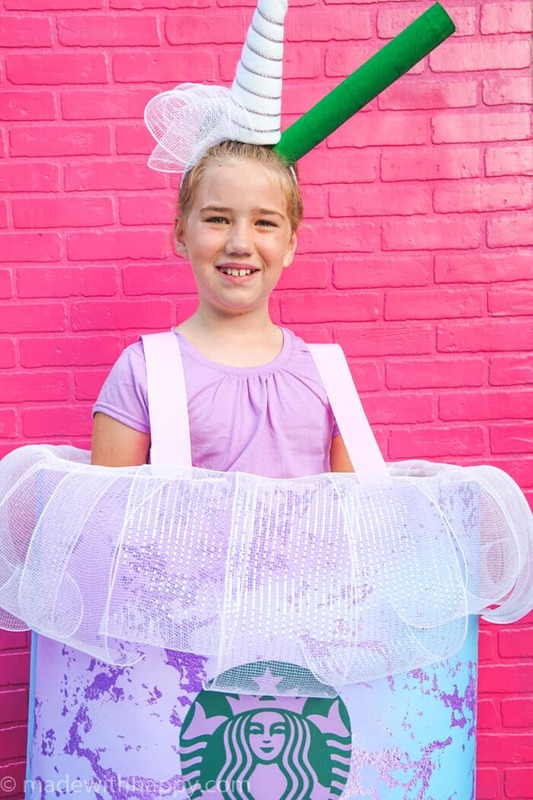 This fun costume can be worn by both kids and adults with no adjustment needed. 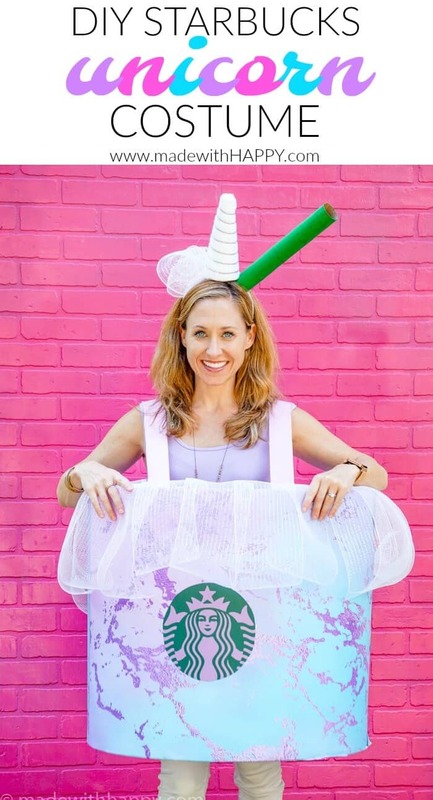 Here is all you need to make your own Starbucks Unicorn Drink DIY Costume. Start by taping the smaller ends of the poster board together butting each end together. 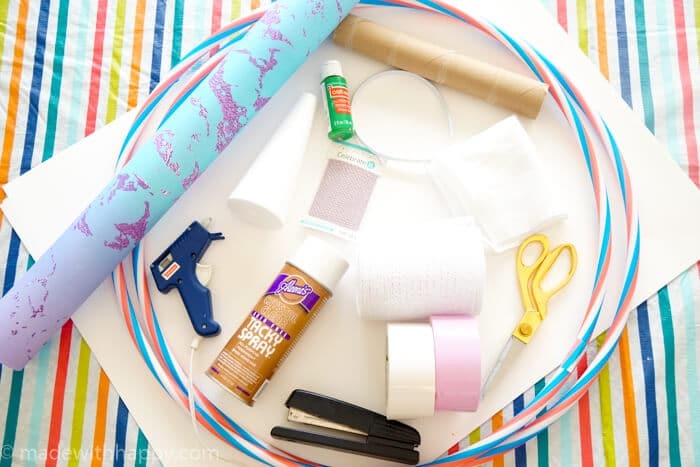 Wrap the taped together poster boards around the hula hoop to create a cylinder. Once you have the size, overlapping the first and third poster boards, attach them together with the stapler. Holding one of the hula hoops in place, using the duct tape, attach the poster board to the hula hoop all the way around. Do the same for the second hula hoop on the other end. Cut your mesh ribbon into approximately 1 foot pieces. I used approximately 30 pieces. You can add more for a fuller “foam” look. I attached the ribbon to the inside of the poster board using the white duct tape. You will want to make sure the ribbon is curling up and out of the poster board. Next you add the wrapping paper to the outside of the cylinder. I used the duct tape to attach the first side and then roll it around the outside. Cut down the excess wrapping paper and use the excess for any gaps in the back of the cylinder. I attached the second side and the additional piece with the spray adhesive glue. I then made the straps out of the lavender duct tape. We cut two pieces of duct tape approximately 34 inches and two pieces at 28 inches. We placed one of the 28 inch pieces sticky sides together with the 34 inch tape leaving about 3 inches of sticky tape on each side. Repeat with other two pieces of tape. Tape the straps to the inside of the cylinder right below the hula hoop approximately a foot apart. I then reinforced the tape with a 3 inch piece of tape across the attached piece to make sure it would stay in place. Wrap your foam cone with a white piece of felt and hot glue in place. Starting at the top of the cone, hot glue the purple twine down and then twist it around the cone pulling it tight giving your unicorn horn a twisted look. Hot glue the other end to the bottom of the foam cone. 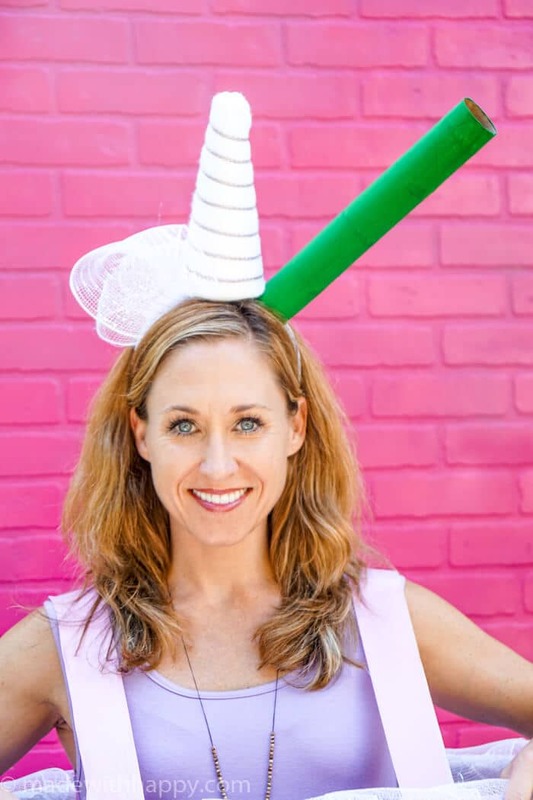 Attach unicorn horn to the white headband with hot glue. Make two small cuts – one on each side towards the bottom of the paper towel roll. This will allow for the headband to slide through each hold and stay standing. Twist one or two pieces of the mesh ribbon and hot glue to the other side of the unicorn horn to create additional foam look. Cut out the label and then attach to front of cylinder using spray glue. I have to tell you that I was able to get a number of things at my local dollar store. I found the poster board, hula hoops, foam cone, and white headband there. I would definitely start there to cut down on cost. 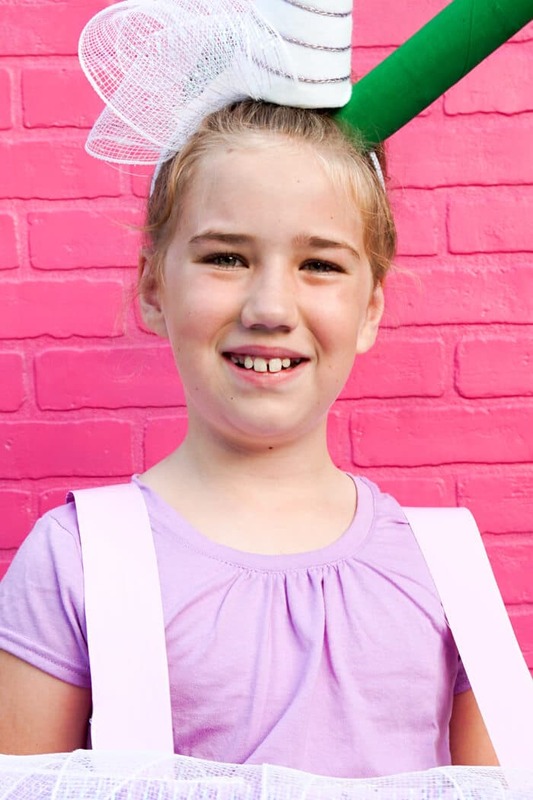 Simply wear your lavender shirt and some neutral pants or shorts and you have yourself the most fun costume of the year! 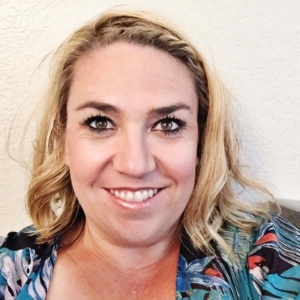 I can’t wait to see if you make it! Email pictures or tag us on social media when you are dressed up! Awesome job! 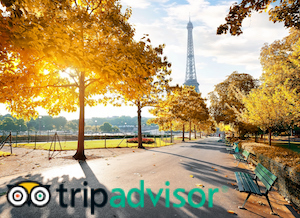 It looks super easy and affordable! Wow! Clever.